GRAPHIC WARNING: This post contains graphic images which some viewers may find disturbing. 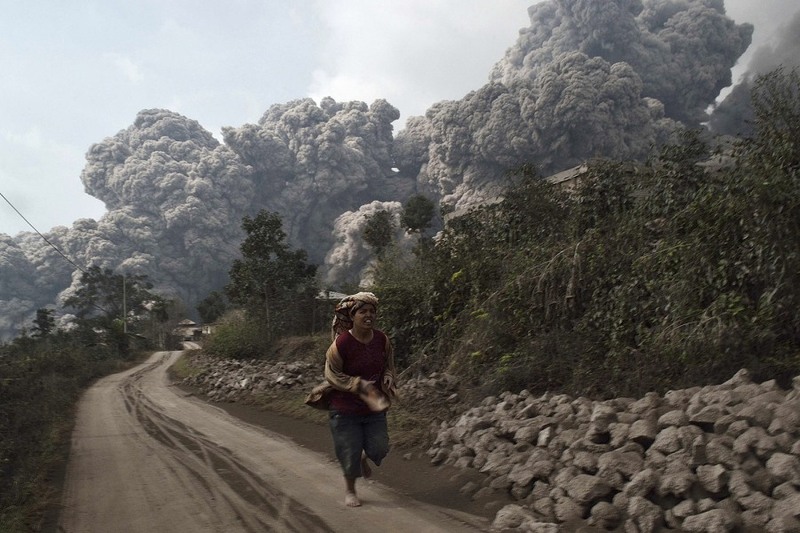 A villager runs as Mount Sinabung erupts at Sigarang-Garang village in Indonesia's North Sumatra province on Feb. 1. The eruptions came just a day after authorities allowed thousands of villagers who had been evacuated to return to its slopes. AP reports: The death toll rose to 16 after an eruption of Indonesia's Mount Sinabung volcano on the western island of Sumatra on Saturday, government officials said. The 8,530-foot-high volcano erupted just a day after authorities allowed thousands of villagers who had been evacuated to return to its slopes. Rescuers found 15 bodies, and a 24-year-old college student died of burns in a hospital on Sunday. Among the dead were a local TV journalist and four high-school students and their teacher who were visiting to see the eruptions up close, said National Disaster Mitigation Agency spokesman Sutopo Purwo Nugroho. The volcano has been erupting for four months, spewing ash miles into the air. Tens of thousands of residents have been evacuated from the area, but 14,000 living outside a three-mile danger zone were allowed to return on Friday. 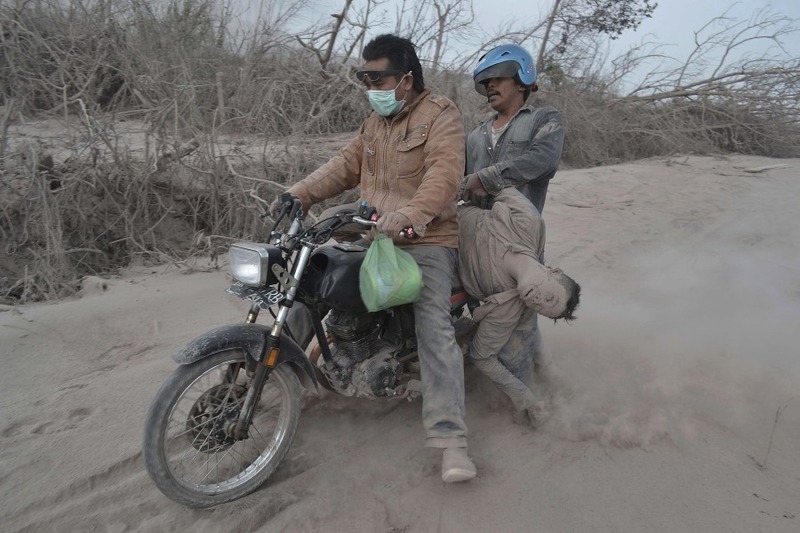 Indonesian residents carry a victim on a motorcycle following the eruptions. 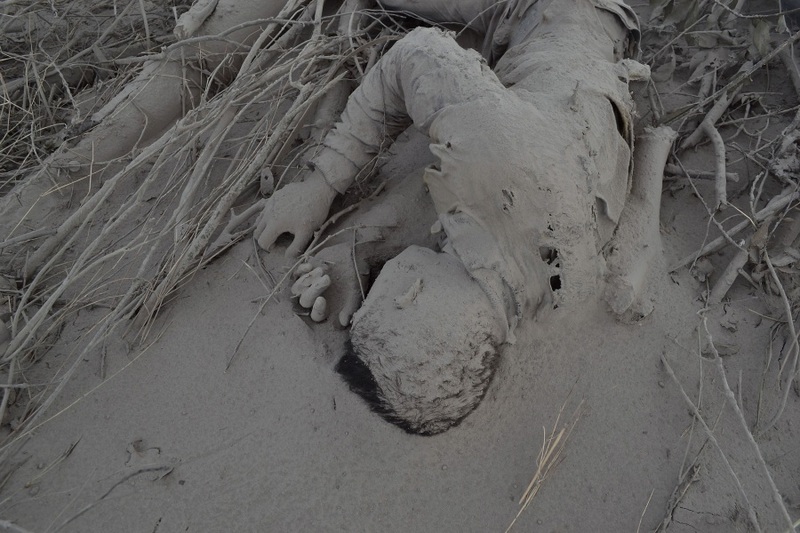 The body of a victim is covered with hot volcanic ash.